Durable ORKA toy that stands up to tough fetch and play 1) ORKA material is tough during chew, but easy on dogs' mouth during the catch 2) Fun, floatingg shape for hourd of fetch paly 3) Easy to grip and toss 4) Multiple textures amssage gums and add interest 5) Thick rim for added durability 6) it floats! The perfect toy fpr dogs that love to chew. 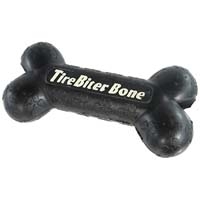 The ORKA Bones solid construction is durable yet"Chewy", helping to curb a dogs; urge to chew. 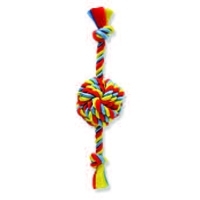 1) Perfect shape to chew, carry & chase 2) Flat, firm design helps exercise jaw muscles 3) 100% cotton rope removes soft tartar as dog chews 4) Multiple textures massage gums and keep interest 5) Solid construction for added durability 6) It bounces and floats! Large 18" Float Rope Monkey Fist Ball with rope ends. Made from premium Polypropolene materials that float & repel water. A fun ball shape that dogs love. Rope fibers floss dogs' teeth while they chew & play. A great interactive toy for large dogs. Small 6" TireBiter Bone w/Treat Station. 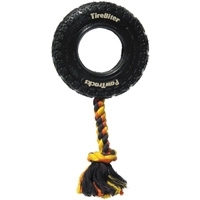 Made real tire tough for heavy duty chomping & interactive play. Patented two-ply nylon formula flosses while dogs chew. Great for small - medium dogs. Med. 8" TireBiter PawTrack. 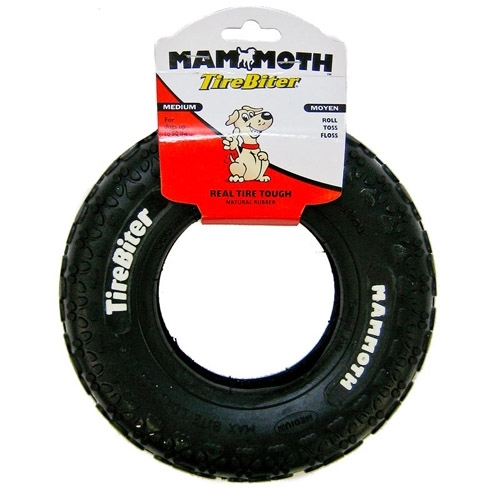 Made real tire tough for heavy duty chomping & interactive play. Patented two-ply nylon formula flosses while dogs chew. Great for medium dogs. Small 6" TireBiter PawTrack. Made real tire tough for heavy duty chomping & interactive play. Patented two-ply nylon formula flosses while dogs chew. Great for small - med dogs. Mini 3.5" TireBiter PawTrack. 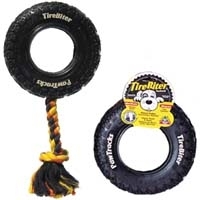 Made real tire tough for heavy duty chomping & interactive play. Patented two-ply nylon formula flosses while dogs chew. Great for small dogs. 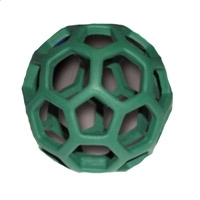 We studied the shape of a carbon molecule, its similarity to the geodesic dome and imagined that as a totally out-of-this-earth, fun dog toy. 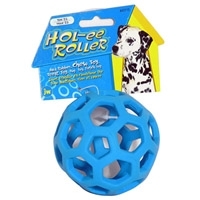 And we invented the popular Hol-ee Roller. 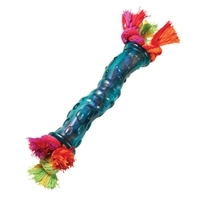 It’s a stretchy, virtually indestructible fetch, chew, tug and treat toy. Bridges the gap between treats, play and exercise. 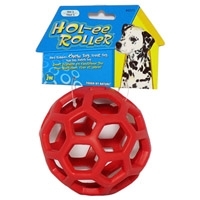 Solid rubber toy holds treats and stands up to chewing and gnawing as your dog works for his reward. Dogs stay busy trying to remove tantalizing morsels from the patented Goodie Grippers™. Helps curb destructive chewing and promote proper chewing habits. Made of nontoxic, extremely durable natural rubber. 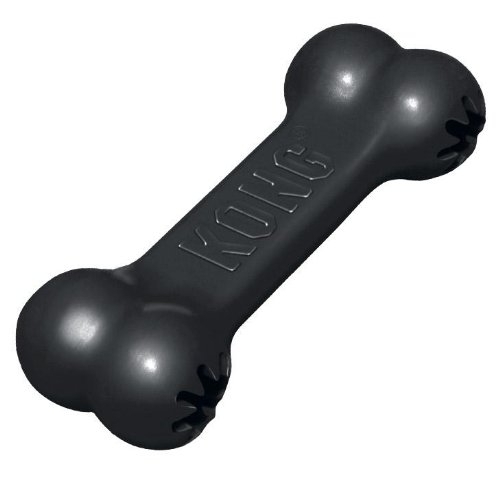 Kong Goodie Bone will keep your dog entertained and out of trouble for hours. 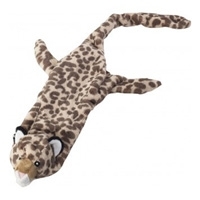 Ethical Mini Skinneeez Plush Dog Toy Jungle Cat Assortment 14"
Ethical Mini Skinneeez Plush Dog Toy Arctic Assortment 15"
KONG Tugga Wubba is the newest toy in the KONG Wubba line of dog toys. The Tugga Wubba is a fun, interactive tug and toss toy made out of durable reinforced nylon and includes a squeaker. 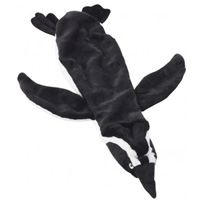 The tails make it easy to pick up, throw, or tug, and dogs love the squeaks. 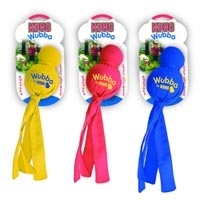 The Tugga Wubba comes in 3 sizes and is available in assorted colors. 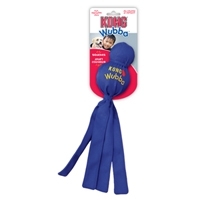 Kong Wubba is a fun, playful, interactive toss and tug squeaker toy. 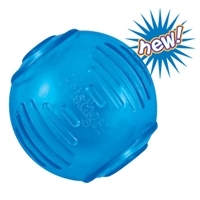 It's durable reinforced nylon fabric covers two rubber balls - A Tennis ball on top and a squeaker ball beneath. The long tails make it easy to pick up and throw. Dogs love to squeak the Wubba and shake the flapping tails back and forth. Available in assorted vibrant Red, Yellow and Blue. Happy Birthday Squeaker Tennis Balls will make any dog's birthday a hit. 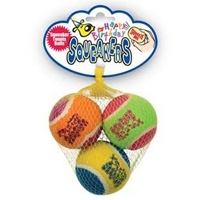 These colorful versions of our popular medium squeaker tennis balls are imprinted with a "Happy Birthday" logo. 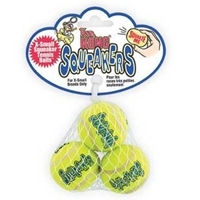 Small squeaker tennis balls have all the great features of the larger Air Kong Squeaker Tennis Balls, but are designed with the miniature and toy size dog in mind. 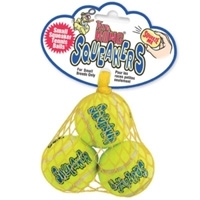 These small and extra small squeaker balls come three to a package. 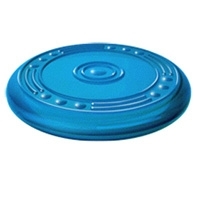 The KONG Flyer is the best soft rubber disc on the market. 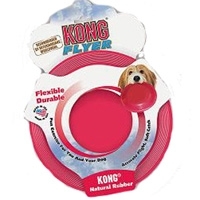 Made with durable KONG Classic rubber, the Flyer won’t hurt a dogs teeth during fun games of fetch and catch. 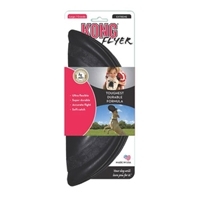 The KONG Extreme Flyer is made out of our ultra-durable Extreme rubber to stand up to the rigorous demands of even the most enthusiastic dogs. Flexible enough to be folded for easy portability, but rigid enough to fly, the Extreme Flyer is perfect for active dogs. The classic kong is know for its strength, quality, and performance. Its super bouncy, red, natural rubber provides hours of enjoyment. It also cleans teeth and gums while playing. Great for small breeds.